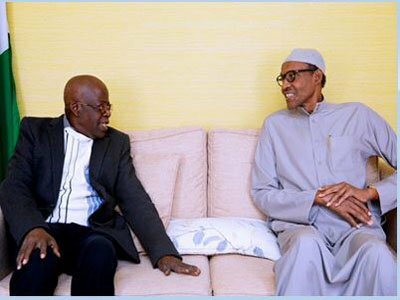 President Muhammadu Buhari yesterday met with All Progressives Congress (APC) stalwart Asiwaju Bola Tinubu in London. The President’s Personal Assistant on Social Media, Bashir Ahmad, made this known via Twitter. NAN reports that the President, who is on official visit to the United Kingdom, met on Wednesday with the Archbishop of Canterbury, Justin Welby, in London. The President is also billed to hold discussions on Nigeria – British relations with Prime Minister Theresa May before the Commonwealth Heads of Government Meeting (CHOGM) scheduled for Wednesday till Friday. Meetings are also scheduled with some prominent Britons and Nigerians residing in Britain.